Create one-of-a-kind designs for your floors with FLOR tiles. Offering a variety of colors, styles and textures, FLOR tiles can be combined to create custom rug designs. Select a predesigned pattern or start from scratch and design your own unique rug pattern. 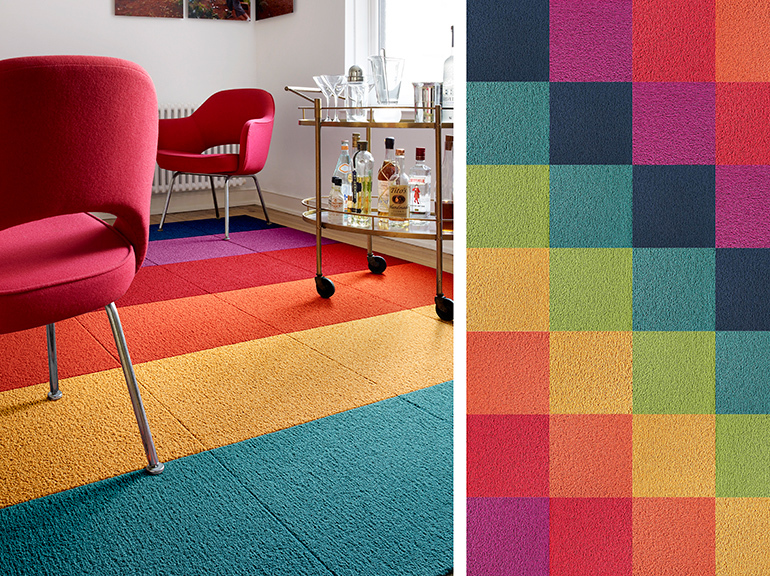 FLOR rugs are a refreshing approach to floor fashions. The tiles can easily be refreshed and damaged tiles can be swapped out. Not only are the tiles washable, but they are also non-toxic, hypoallergenic and low VOC. Check out the creative ways the tiles below can be reconfigured to give your space a new, fresh feel. ONE: Soda Shoppe Rug: Parallel Reality tiles in burgundy, green, pink, purple and teal. Opposite page, top: Berry, a patchwork design of five colors in Parallel Reality. Opposite page, bottom: Berry Twist, the same tiles are turned on a 45 degree angle with diagonal cut edges for a completely new look. TWO: Citrus Spotlight Rug: Heaven Sent tiles in tangerine, marigold, kiwi, teal, indigo, persimmon and magenta. 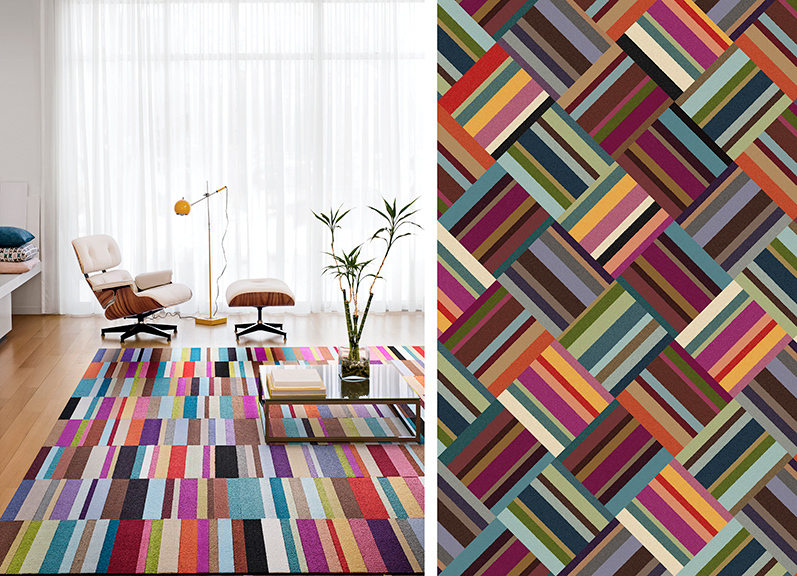 Above left: Sangria Stripe rug of all Heaven Sent tiles. Below: Same quantity of Heaven Sent tiles with each row shifted to create a diagonal patchwork. THREE: Kensington Gardens in Black. Three tiles all configured in a different way. Kensington Blossom, Kensington Blend and Kensington Current gives a much more subtle, neutral look.